You need some special software on the computer to send data to the parallel port to control the functions of your electronic circuit. Fortunately, you don’t have to be a programmer to create this software, because software that does this job is readily available on the Internet. The simplest software available, called Kit 74, is designed to work with a popular kit that lets you connect relays to the parallel port. To find the software, just search for “Kit 74 software.” The software is contained in an archive file named k74_dos.zip. Download it to your computer and extract its contents to a folder on your hard drive named C:k74_dos. To use the commands, click the Windows Start button, type cmd, and press the Enter key. 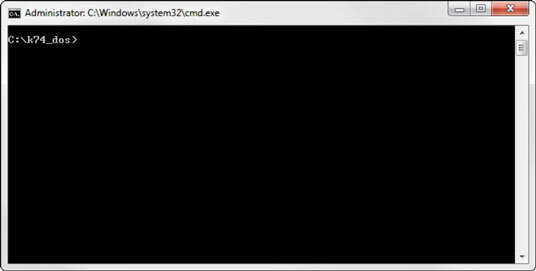 (In versions prior to Windows 7, you must click Run after you click the start button; then type cmd.) An MS-DOS command window opens. This command transfers you to the folder in which you saved the Kit 74 commands. Then you can type and run the commands to test your parallel-port circuits. The Kit 74 DOS software consists of three commands — RELAY, DELAY, and WAITFOR — that you can run from a command prompt.